Interiors of Excellence is a longtime Princeton business that specializes in doing custom upholstery work. In business since 1966, it's located three miles west of Princeton on Highway 95 and 115th Avenue. Owner Bill Braun has been in charge of the business since 1995, when he took over after his father Jim Braun retired. Braun calls his business Central Minnesota's most innovative upholstery shop. "Furniture, cars, boats or commercial, if it has fabric of any sort, we can recover it," Braun said. Besides Braun, the company has two part-time furniture specialists: Jim Hager and Ray Tice. The pair work their magic bringing chairs and couches back to new condition. In addition, Brody Cordes, a Princeton High School senior, works 25 hours a week as an apprentice. Braun's marketing plans include taking steps to increase recognition of his business and all aspects of what they do. Besides his website, www.interiorsofexcellence.com, and his Facebook page, Braun also plans to employ an outside sales and decorating representative as well as advertise in local and regional newspapers. People gave him a hard time for years because he didn't have a sign up, he said. "I never advertised. One of the reasons for that was I didn't have the right people. You don't get the trust you need with the wrong players. For years we were spinning our wheels. Now, with the right people in place, we have found the traction for success," Braun said. "A lot of business is word of mouth. The cars are mostly word of mouth," Braun said. Customers come from all over the region. One of the most interesting jobs they did was refurbishing the tour bus of country singer LeAnn Rimes in 1998. He is active on his Facebook page, which averages about 400 hits a day. "I put pictures of every project we do, from start to finish, on Facebook so people can see how the project progresses, from start to finish," Braun said. Braun has a special affinity toward doing upholstery work on vehicles, and to assist him in that part of the business, he has hired Tim Allie. "Tim is an automotive interior specialist with over 20 years of experience and a work ethic second to none," Braun said. When doing a custom interior for a customer, Braun does all the designing and Allie does all the sewing. Recently Braun and Allie finished work on a 1956 Ford Club Sedan 2 Door that has had a total restoration. The owner of the car found it in the Arizona desert and bought it for $300. "The car had no motor, no transmission, totally full of garbage but it was rust free," Braun said. "He took it home and got all the garbage out of it, then power washed the car and it was spotless so he decided to restore it," Braun said. Once the outside of the car was restored and a new motor installed, the car was brought to Braun's shop for a new interior. "We spend a lot of time and money making our vehicles look nice on the outside, but since we spend most of the time on the inside, it makes sense to make the interior stand out too," said Braun. "It can take up to a month to finish a custom interior," Braun said. Once Braun comes up with a design for a seat, he covers the springs in burlap and draws the design. Using the design on the burlap, Allie is able to sew whatever fabric they're using into a finished seat. The same process is used on the door panels and trunk. 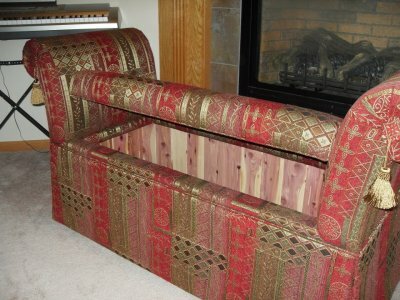 It was decided to do the interior in a classic tuck-and-roll, which is a technique that results in seats with extra cushioning, but also doesn't show any stitching. Parked in the bay next to the 1956 Ford was a Four Winns Horizon boat which was undergoing an interior makeover with new colors added to the seats. Matching exterior paint will be applied by subcontractors before the customer picks up the boat. Even though Braun has been in the upholstery business for years, he still strives to keep up on new trends and techniques. With this in mind he spent four days this year visiting Gabe Lopez, owner of Gabe's Street Rod Custom Interiors in San Bernardino, Calif.. Lopez was the featured upholstery shop on the Discovery Channel's American Hot Rod show. "They do first-class work, so I was hoping to learn a few things to bring back to Minnesota," Braun said. "It was fun to see how they did things. I learned quite a bit. I also saw that a lot of things they do, I do the same things," Braun said. Braun is constantly coming up with new furniture ideas. One of the latest designs is a custom built foot-board bench with a built in cedar chest. He originally built one as a Christmas present for his wife. It turned out so well and was so popular that it is now a regular production piece. "We can build this tailored to the size you need," Braun said.. Another popular piece is a custom built cedar lined ottoman. Whether you need your grandma's rocking chair restored, or need an interior in your motor home, Braun and his team can do it. Interiors of Excellence has also won several awards on the Antique Car circuit. "It's fun to take something that is worn out, looks shot, something that most people would throw away, and rebuilt it into something beautiful and very useful," Braun said. Interiors of Excellence services all of Central Minnesota. They will also travel outside of the area to help customers with design and color choices so their furniture will be exactly what they want. For more information you can call Interiors of Excellence at 763-742-2275.